Starbucks Coffee in Hong Kong still has the Christmas Spirit: commercialism unhampered by political correctness. 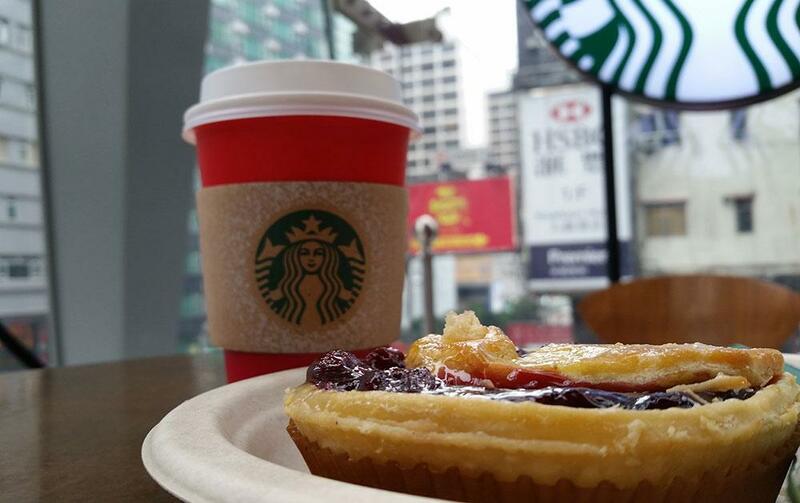 Boaz enjoying a Xmas Cherry Pie and Christmas Blend Starbucks coffee in Hong Kong. Starbucks Coffee enjoys international brand recognition, and I’m grateful for that. After my arrival in Hong Kong, I was suffering the debilitating effects of jet lag. I spent some 29 hours in transit flying from a Jewish Voice event in Florida to our seminars in Hong Kong. I’ve been through so many different time zones in the last week, from Jerusalem, to Florida, to Hong Kong, that I really had no idea what time it was, but I knew I needed some coffee. Anyone who travels internationally knows that it’s not always possible to find a good cup of coffee. Starbucks is not everywhere. In Bethlehem I have seen a knockoff called “Stars and Bucks,” but it’s a far cry from Starbucks. I knew we would find a Starbucks in Hong Kong. Unlike mainland China, Hong Kong was a British colony up until 1999. This city is more western than most cities in the west. My colleague and I located a Starbucks on the third floor of a commercial center in Hong Kong’s equivalent to New York’s Times Square. It was a clean, well-lighted place overlooking busy streets plastered with enormous billboards, LED screens, and a pure, unbridled celebration of materialism. A piece of “Xmas Cherry Pie” caught my eye, and the coffee of the day was the “Christmas Blend.” We sipped our Christmas Blend coffee while overlooking streets decorated with commercials for the latest fashions, beverages, and electronics. The irony of all this is that, in America, Starbucks Coffee removed some of its Christmas branding from a few of its products and stores. You can still get a Christmas Blend coffee, but there are no longer snowflakes or reindeer on the coffee cups. That decision ignited internet outrage and viral campaigns in defense of Christmas to the point where even Donald Trump is suggesting a boycott of Starbucks. 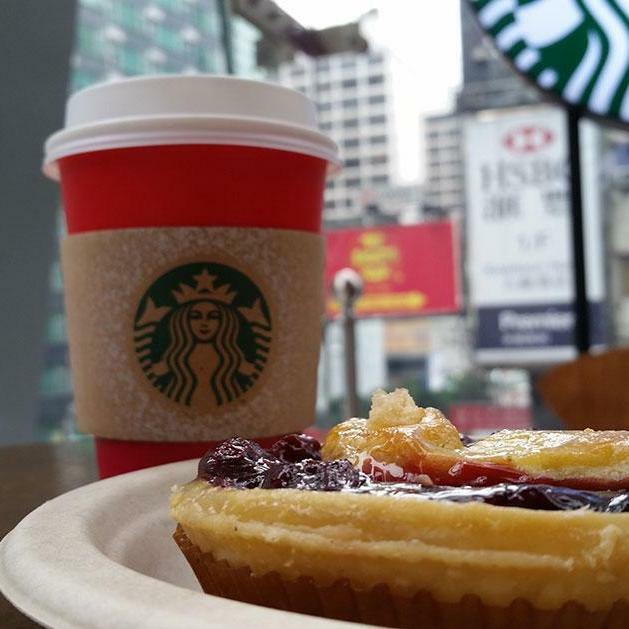 But here in Hong Kong, where most people do not identify themselves as Christian, Christmas is well-understood as merely another opportunity to capitalize with further commercialism; you can get a Xmas Cherry Pie with your Christmas blend coffee. I just don’t understand the outrage. I have never felt personally insulted that Starbucks Coffee does not put pictures of dreidles and hanukiahs on my coffee cup. I have never been bothered that I can’t get a hot cup of Rosh HaShanah Blend coffee during the High Holidays. What is it that makes Christmas so sacrosanct in the minds of American conservatives? Are there not better battles to choose? I will admit, I did feel a little offended that the Xmas Cherry Pie wasn’t certified kosher. I would have really liked to have some with my Christmas Blend.